Drawing on the wisdom of the Second Vatican Council's landmark teaching on the universal call to holiness, Pope Francis addresses all Christian women and men in his latest apostolic exhortation Gaudete et Exsultate and invites them to fully embrace their baptismal call to live the Gospel. Fr. Horan guides readers through Pope Francis's apostolic exhortation with helpful commentary, additional context, and expert insight. 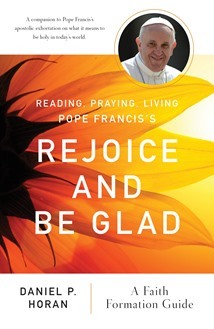 Each chapter includes suggestions for prayer and reflection questions, which makes Reading, Praying, Living Pope Francis's Rejoice and Be Glad an ideal resource for adults, students, and faith formation groups interested in learning more about this teaching and exploring their own spirituality. This is the most extensive and helpful commentary on Gaudete et Exsultate available anywhere. It does not include the full text of the apostolic exhortation. Daniel P. Horan, OFM, is assistant professor of systematic theology and spirituality at Catholic Theological Union in Chicago. He is the author of numerous popular and scholarly articles and several books including All God's Creatures: A Theology of Creation (2018), God is Not Fair and Other Reasons for Gratitude (2016), and The Franciscan Heart of Thomas Merton: A New Look at the Spiritual Influence of His Life, Thought, and Writing (2014).